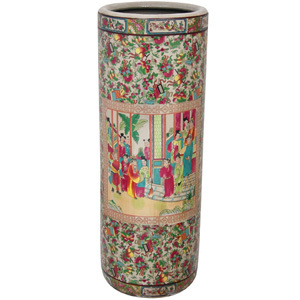 This two-foot tall round umbrella stand is crafted with high-temperature-fired, durable Chinese porcelain. Bands at top and bottom feature traditional Rose Medallion panel-style lotus and bird art and hand-painted Asian courtyard scene. The colorful body has a floral, fruit, and oriental object themed pattern. This stand is finished in a high-luster glaze. This stylish Asian accent offers practical umbrella storage or can be used as a unique tall bamboo planter. Story Behind the Art: This handcrafted item and many others come from a third generation family-run workshop in mainland China. Their skills of hand-painting, hand-rubbed lacquering, and hand-tooling have been passed down for many generations. We are proud to support them in their quest to keep their age-old techniques alive for future generations. Many of the artists are hired out of semi-retirement to work from home training the next generation to become master craftsmen. These masters are highly respected in their craft and their culture which have survived through many Chinese dynasties and continue to produce valuable and desirable pieces for your home decor.